This year for mothers day I asked my husband for two gifts. One was some milk paint to refinish some furniture and the other was a fire pit in my backyard. We were having the family over on Sunday and I wanted to spend some quality time around the fire pit roasting weenies. Sounds like fun right? Having a fire brings back many memories of going camping as a kid. Some of our best childhood memories have happened at Sauble Falls Provincial Park. My two sisters, brother and I still frequent the park in the summer months. My two year old would have loved some family fireside time. Being that she is the first grandchild on my side of the family, she gets a lot of attention! Unfortunately, it was terribly chilly and poured rain on and off all day mothers day. So, my dream did not quite come true. This is how "we" did it... Okay so it was the hubby who did all the work. I just picked out the stones, brought them home and showed the hubby how I wanted the design to be laid out. Dig down 6" where you want your fire pit to be. 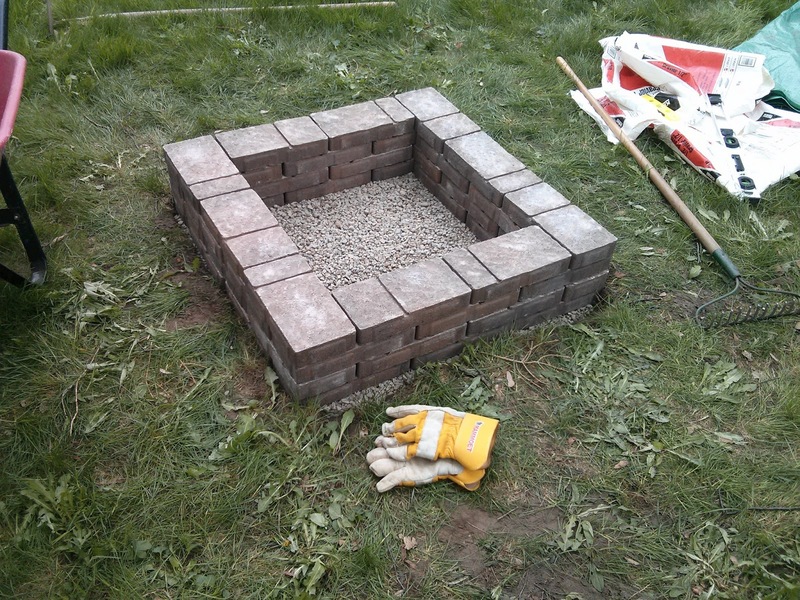 It was easy for us as we chose a square fire pit. 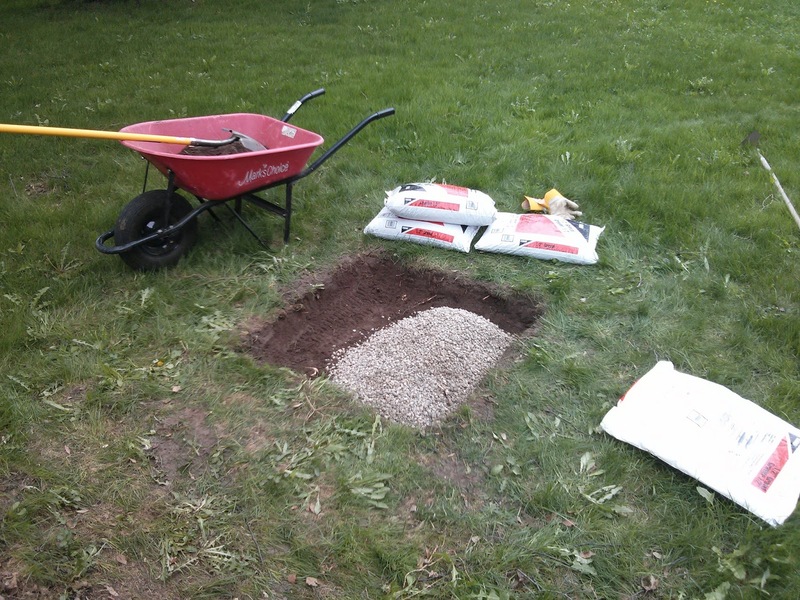 If you are digging for a circular pit, place a stake in the middle of where you want your pit to go. Tie a piece of rope around the post making it the length of the radius (or half of your diameter) of your fire pit. Placing another stick or marking device on the end will allow you to pull the rope tight and mark evenly around your circular pit. Then dig out as you would your square pit. As you probably guessed from the picture above, lay down approximately 3" of gravel. This will allow for drainage and a flat even surface for laying your stone. 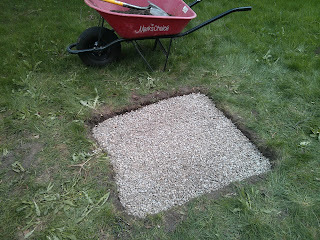 Start to lay your first row of stones, being carful to ensure they are level. Using a level is a great way to make sure your pit will not end up tumbling in the future. We chose to make our first layer of bricks sit down in the hole. This again will just add to the stability of the structure. Place the other layers of stones on top, alternating where the stones meet. This again will help to ensure your fire pit continues to be sturdy. Isn't it Beautiful??? I cannot wait to find some chairs and small tables to place around it. Also, to use it for the first time. Sounds like it is to be a beautiful long weekend! Maybe we will have our first weenie roast on the May 24 weekend. Thank you hubby for all your work! I love it and look forward to many happy memories around it. I believe a fire pit can be one of the most gratifying things a mother can ask on her day. Although it is a whim, it isn't selfish. Having dinner around a fire is an experience each and every one involved would appreciate and would want to do repeatedly. On another note, I suggest adding one or two pile of bricks on it. One is for the safety of the kids, so they wouldn't be able to reach the fire. It also allows a bigger fire on your next gathering. Charles A. Hones, Inc.
How much for the entire project? It was $60. But it can be done for much cheaper. Depending on the stone you choose. And where you live will affect the cost of the stone. Everything seems to be a little more expensive in Canada. We can never do things quite as inexpensively as bloggers from the USA. Thoughts on gravel verus san for the base? I've seen some with gravel and some with sand. This is a complete guess. But maybe the gravel won't wash away and the sand would????? We just chose gravel and didn't even think to use sand. My guess is that sand would not drain as well as gravel. Sand has actually been used to filter water. What did you use in the center to make that are circular to hold the wood? Ginny you can get fire rings on Amazon for around $15 some were a little more. They even have ones with cute little cutouts on the side. The sand would hold the water in longer...gravel is the way to go..but you could also use river rock, if it is handy..
That looks amazing! I love that is a square as opposed to a circle. Looks great and an easy day project.Thank you for sharing. Thanks for sharing - it's a great firepit! What are the dimensions of it? Also, I was wondering if you used any masonry adhesive between the stones. Thanks! Be very carfule of what kind of stone you use for the sides, it CANNOT BE ANY KIND OF CEMENT STONE OR PRECAST when these get hot they pop off chunks of stone and will send hot sharp shrapnel into anyone near. Always use natural stone or firebrick, firebrick being the choice here. So enjoy your fire pits they are awesome !! What did you do to finish it off...the rocks..and circle thing.. I'm also wondering what you used to finish it off to make it look like the picture. 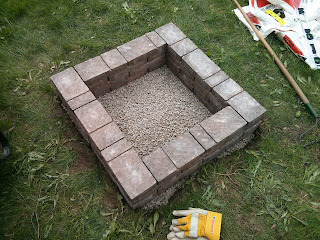 cndn_grl08, if you looked at the pic from FB, the finished product is a different fire pit that what this blog shows. Same concept, but different. Hey! I was wondering if I could use your pictures (linking back to your post here) on a blog post tutorial on how to build this up on my site, http://TipsForSurvivalists.com ? Would love to be able to share this! Any adhesive used? What are the dimensions? Please and thx!! As a safety precaution to keep stones from shifting if knocked by a lawn mower, for example, or if firewood shifts, I would have put a bead of landscaping caulk down for each row stack. A tube of caulk can be found in the caulk section of your local home improvement store for a few dollars. �� I like it though! What did you use to hold bricks together? Your final picture looks different than the last picture. What else did you do and what is the circle in the middle? Same thing. Just different angle. Amber, I don't see anything in the materials you used that would account for the circular structure in the middle. What is that structure made from? 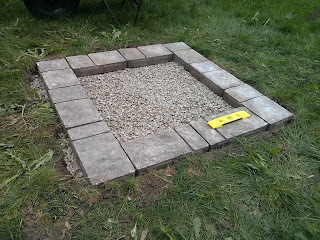 i dont think the picture you are all referring to is of this fire pit, i think it was added by a someone else, as you can look and see the stone work is different. The easiest and cheapest circular item to use is an old tire rim from a truck or a tractor, depending on how large a pit you intend to build. If you do not have one of these, go to your nearest junk yard. They will sell you one for scrap weight. Since scrap prices are down right now it will not cost much at all. Be sure to place the rim into the firepit on top of the first layer of gravel and then fill in around it with the decorative stone. Could this be built on a concrete slab? Amber, asking permission to use your photos and pit plan in our local publication called Hey Y'all Magazine. Will of course credit your photos and story. Please let me know and thank you!. You are most welcome to use the photos and plans. I am very honoured. The pricess is called "spalling". It happens when the mousture trapped inside the brick/stones boils and tries ti escape. That is why River Stone would be a dangerous choice for the base or inside the put. Fire brick is made of low mousture materials so it's safe ti use. what is the stone that you can buy? Did you get at Lowes? This finished product doesn't look the one in the photo...am I missing the last steps, somehow?